Enjoy a delightful chat between WWNO's Fred Kasten and New Orleans legend Dooky Chase Jr. The Dooky Chase Orchestra, circa late 1940s. Photo courtesy of Hogan Jazz Archive, Howard-Tilton Memorial Library, Tulane University and the Chase Family. Click here to enjoy a most delightful chat between WWNO's Fred Kasten and New Orleans legend Dooky Chase Jr. about Dooky's life, his music, and his friends. This podcast was made in connection with MASNO's upcoming "GREAT SCOTT! Joplin in the Quarter" concert featuring the music of Scott Joplin performed by American pianist Richard Dowling. "GREAT SCOTT Joplin in the Quarter" will be held on Sunday, March 12, 3:00 PM at Le Petit Theatre and is lovingly dedicated to the memory of Edgar L. "Dooky" Chase Jr. For tickets and more info, CLICK HERE. Join WWNO's Fred Kasten as he chats with Richard Dowling on Inside the Arts! Tune in to WWNO's Inside the Arts to join Fred Kasten as he chats with American pianist Richard Dowling about his life, music and New Orleans performance GREAT SCOTT Joplin in the Quarter! coming up on Sunday, March 12, 3:00 PM at Le Petit Théâtre! Click the photo to listen! Click here for more info on the concert and to purchase tickets! MASNO Executive Director Cara McCool Woolf chats with Diane Mack on on Inside the Arts! Join MASNO Executive Director Cara McCool Woolf as she chats with WWNO's Diane Mack about Festival PiaNOLA featuring Anne-Marie McDermott and Concerto Showcase IX on this week's edition of Inside the Arts. Cara's interview airs around 18:30 into the program. Click here to listen. Thank you for your support of the Musical Arts Society of New Orleans by your attendance at our musical events and your membership in the Friends of MASNO. We are pleased to be presenting a full calendar of concerts and special musical events for the 2016-17 Season as this is a goal for which we have worked, and one that you have helped us accomplish! The 26th New Orleans International Piano Competition this past July brought twelve extraordinarily talented pianists to New Orleans. These semifinalists were carefully chosen from a record-number of 186 applicants representing 28 different countries. We are thrilled that our three top medalists, Xiaohui Yang, Re Zhang, and Scott Cuellar will return to New Orleans in January to perform with the Louisiana Philharmonic Orchestra in a MASNO signature event Concerto Showcase IX. This year, Concerto Showcase is the finale concert of an exciting new collaboration with the LPO – Festival PiaNOLA! This festival of celebrating the piano includes a community master class, orchestral performances and a salon concert by festival artist Anne-Marie McDermott while concluding with Concerto Showcase IX. We are very excited about this new venture with the LPO, and hope that you will be able to attend one or more of the festival events! In October, we welcomed classical guitarist Pavel Steidl of the Czech Republic who played a fantastic house concert. In addition, 2014 Piano Competition Gold Medalist Marianna Prjevalskaya gave a brilliant performance with the Acadiana Symphony Orchestra of Lafayette, and we look forward to her performance with the Baton Rouge Symphony in February. We are very proud of our 2016 New Orleans Piano Institute Concerto Competition Winner Anna Waldron who returned to New Orleans for a wonderful performance with the New Orleans Civic Symphony courtesy of Hall Piano Company and the Steinway Society of New Orleans. Our annual fundraiser gala NOCTURNE XIV, held in November, was a beautiful experience. Acclaimed Israeli pianist Inon Barantan played an exquisite program that combined with all of the other elements of the evening to create a very special and unforgettable night. In looking ahead, we are excited that former piano competition gold medalist, Richard Dowling will perform at Le Petit Theatre du Vieux Carre on Sunday afternoon, March 12, in a “Great Scott” concert commemorating the 100th anniversary of the death of Scott Joplin! And of course mark your calendars for the 2017 New Orleans Keyboard Festival to be held the last week of July. It is because of the generous support of our MASNO friends that we are able to present these incredible musical opportunities. MASNO is proud to be able to encourage and support emerging artists as well as bring acclaimed established musicians to the greater New Orleans area. Please click here for additional information about how you can be support MASNO. Thank you for being a Friend of MASNO and Happy Holidays! Congratulations to all 12 Semifinalists for their exceptional performances this week! MASNO is also proud to congratulate the Winners of the 2016 NOIPC! After two magnificent Semifinal Rounds, it was no easy decision for the Jury to select the 3 Finalists who will perform tomorrow. Hope you will join us! CLICK HERE FOR TICKETS! Meet the 2016 NOIPC Semifinalists! Looking forward to welcoming these 12 Semifinalists to New Orleans in less than a week to compete in the 26th New Orleans International Piano Competition! You may read more about them including their bios and repertoire for the competition rounds by clicking on the photo below. Click downloadable version of the letter below. It was an exciting 2015-2016 season for MASNO with an increasing number of wonderful performances and events! Thank you for your support as well as your attendance to many of these musical offerings. From an outstanding 2015 New Orleans Keyboard Festival and Piano Institute to an exciting NOCTURNE XIII, from fabulous Salon Concert Events to our 2014 New Orleans International Piano Competition Gold Medalist Marianna Prjevalskaya performing sold out performances with the Louisiana Philharmonic Orchestra (LPO), from a lovely collaboration with New Orleans Friends of Music presenting world-renowned pianist Angela Hewit to our 2012 NOIPC Gold Medalist Viktor Valkov performing a brilliant recital of rave reviews at London’s Wigmore Hall - it was definitely a most successful year for us – a year we could not have had without you! We trust you enjoyed this past season as much as we did, and hope that you will definitely join us for an exciting 2016-2017 as well! 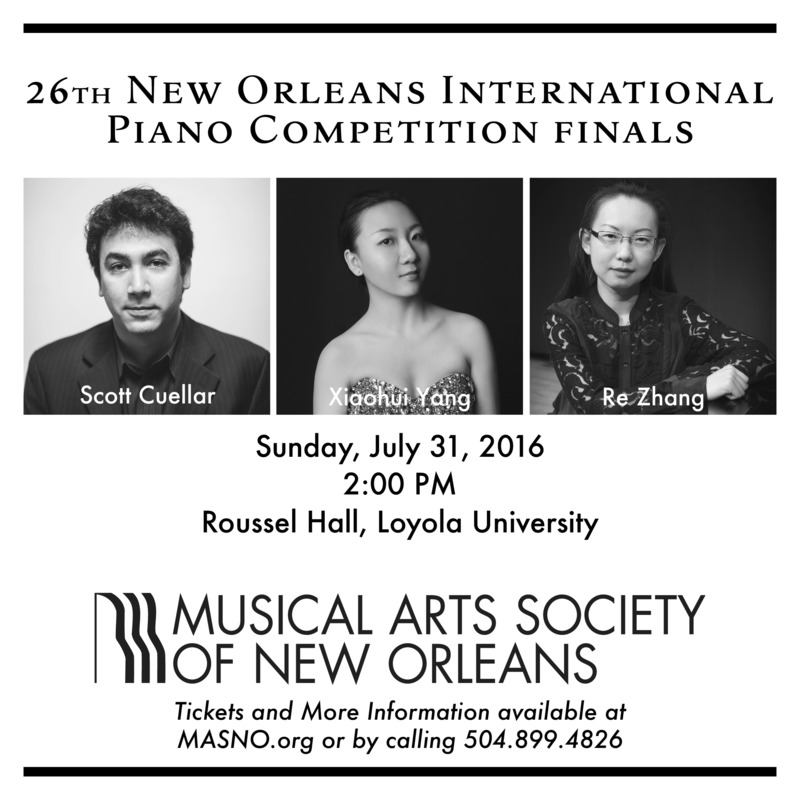 In just a couple of months, MASNO will present the 26th New Orleans International Piano Competition (NOIPC), July 24-31, at Loyola University. 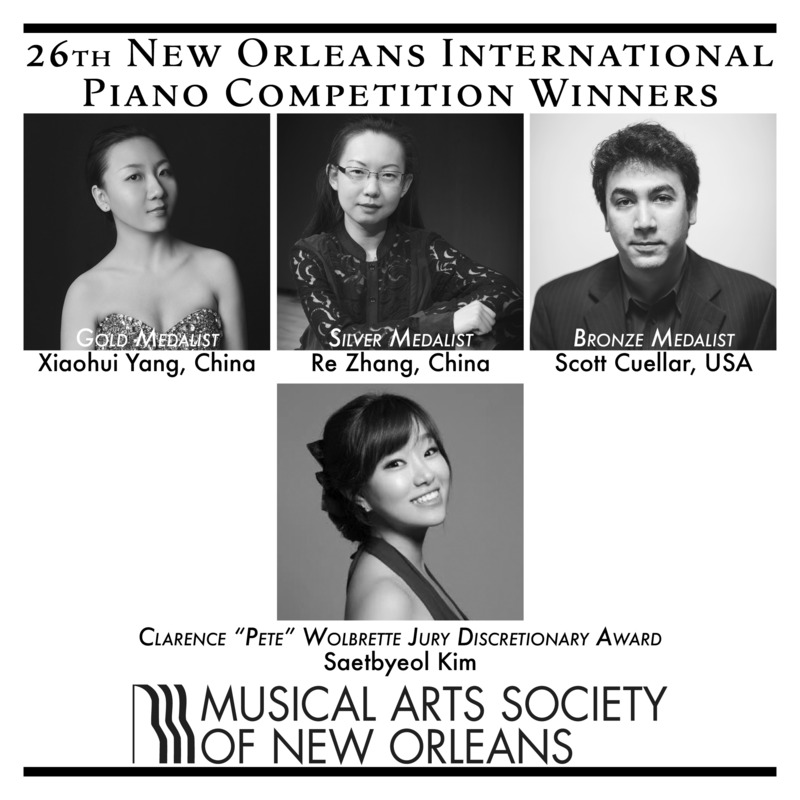 Twelve of the world’s finest young pianists are invited to New Orleans for a week of magnificent piano playing as Semifinalists competing for performance and cash prizes totaling over $35,000. The NOIPC runs parallel to the New Orleans Piano Institute and Keyboard Festival featuring master classes and recitals open to the public. In addition, Guest Artists Marianna Prjevalskaya of Spain and Danny Driver of the United Kingdom will perform solo recitals. With a record number of NOIPC applicants representing 28 countries this year, we are thrilled to announce the 12 Semifinalists joining us in July: Moye Chen, China; Scott Cuellar, USA; Christopher Goodpasture, USA; Matthew Graybil, USA; Yewon Jeong, South Korea; Wenjie Lu, China; Yejin Noh, South Korea; Kyle Orth, USA; Alexander Soares, United Kingdom; Xiaohui Yang, China; Hyun Ji You, South Korea; Re Zhang, China. For a more detailed schedule of the week’s events, please visit www.masno.org. Tickets will be available starting June 10, 2016. Looking ahead to the rest of MASNO’s 2016-2017 Season, highlights include Salon Concert Events featuring guitarist Pavel Steidl of the Czech Republic, 2014 NOIPC Gold Medalist Marianna Prjevalskaya’s performances with the Acadiana Symphony Orchestra and the Baton Rouge Symphony Orchestra, NOCTURNE XIII featuring acclaimed Israeli pianist Inon Barnatan, a special salon concert in partnership with the LPO featuring the fabulous and beloved American pianist Anne Marie McDermott, Concerto Showcase IX featuring the top 3 medalists of the 2016 NOIPC with the LPO, and MORE! Please notice the downloadable brochure that includes more details of our upcoming season highlights. Also stay tuned for additional events through the year! MASNO has also newly instituted an Annual Membership contribution at the Andante $35+ Level. Members will receive an acknowledgement of the membership, a one-year subscription to MASNO’s E-Newsletter, advance notice and ticket pre-sale privileges for exclusive MASNO events, and recognition in the program book of the NOIPC and Keyboard Festival. Please review the downloadable brochure (click here to download) to learn more about membership, sponsorship, and other ways you can become involved and support the Musical Arts Society of New Orleans. We at MASNO are so privileged to be able to present these kinds of musical opportunities in New Orleans as well as play significant roles in the development of young talent and future musical careers through our programming. However, we could not do so without the generous support of our Friends. So we thank you for being a part of our MASNO family, and hope to see you very soon! NOIPC and NOKF Tickets Available for Purchase! Tickets are available for purchase below or by calling MASNO at 504.899.4826. You may also purchase tickets at the MASNO Box Office (located in the Loyola Box Office) starting one hour prior to an event. All tickets purchased in advance will be available at Will-Call at the MASNO Box Office starting one hour prior to the event. Click HERE to purchase tickets!! Click here for a complete schedule of events. We want to welcome you to MASNO's new website. We are in the process of adding more exciting content and functionality. We hope you'll visit the site frequently for general MASNO updates and important important information regarding upcoming events and programs. We're looking forward to an amazing 2015-2016, and we're happy to bring you some fantastic performances! "Musical Arts Society of New Orleans" is a 501(c)3 non-profit organization.